Racing 92 booked a place in the European Rugby Champions Cup against Leicester Tigers by beating Toulon 19-16 at Stade Yves-du-Manoir. 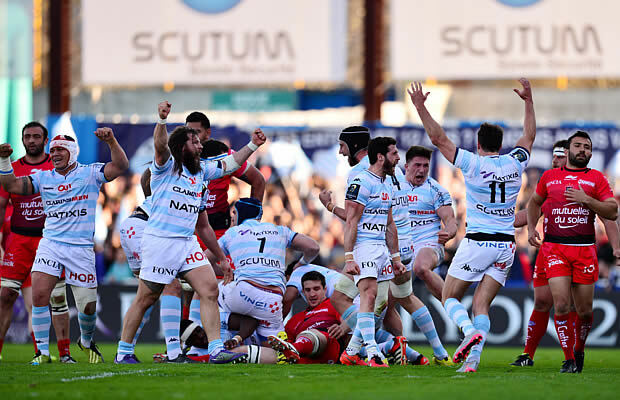 Toulon have won the last three European titles but Racing 92’s victory ends their reign as they have been eliminated. A penalty two minutes from time from the boot of French scrum half Maxime Machenaud kicked the Parisians over the line and into their first semi-final with a 19-16 triumph. Machenaud took over the goalkicking duties when Dan Carter picked up an injury and had missed with three earlier kicks. But he kept his nerve when it mattered most and it means Carter and co will have to head to the City Ground, Nottingham to meet Leicester Tigers in the semi-final. There was an explosive start at Stade Yves du Manoir as the home raced raced into a 10 point lead within the space of five minutes. The points started to flow from the kick-off as English referee Wayne Barnes penalised Charles Ollivon at the first ruck on the Toulon 22. That gave Dan Carter an easy first shot at goal and he was back in action a few minutes later when Argentinean wing Juan Imhoff sniffed out an interception on half-way when Maxime Mermoz tried to find James O’Connor. He raced to the corner and Carter added the extras from wide out. 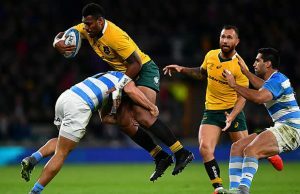 The champions were rattled, but the returning Matt Giteau steadied the ship from outside half and when Josua Tuisova picked out a miss match in midfield on Racing lock Francois van der Merwe, and broke into the home 22, Ollivon was on hand to take the off-load and make up for his earlier gaff with a try. Jonathan Pelissie added the conversion to make it 17 points in 10 minutes and then kicked a penalty on the stroke of half-time to level the scores at the break. 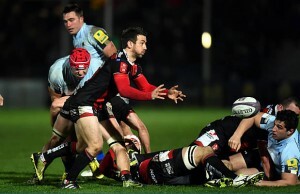 By then Toulon had fully recovered their poise and Racing had lost their skipper, Dimitri Szarzewski. It was Toulon who got the better start to the second half when Pelissie stepped up to kick another penalty four minutes after the re-start. But no sooner had they got their noses in front than they gave away two penalties in succession. With Carter on one leg, carrying a knee medial ligament injury, Machenaud took over the goalkicking duties and having missed one at the end of the first half, he missed another early in the second. He then made amends when he got another shot to level the scores at 13-13 before he put Racing into a 16-13 lead on 53 minutes. Pelissie responded on the hour, making it 16-16, before the dramatic finale. Machenaud missed a third kick on 73 minutes before he hit the mark to steal the glory two minutes from time. Replacements: Jean-Charles Orioli, Xavier Chiocci, Levan Chilachava, Steffon Armitage, Mathieu Bastareaud, Tom Taylor, Eric Escande, Thibault Lassale.